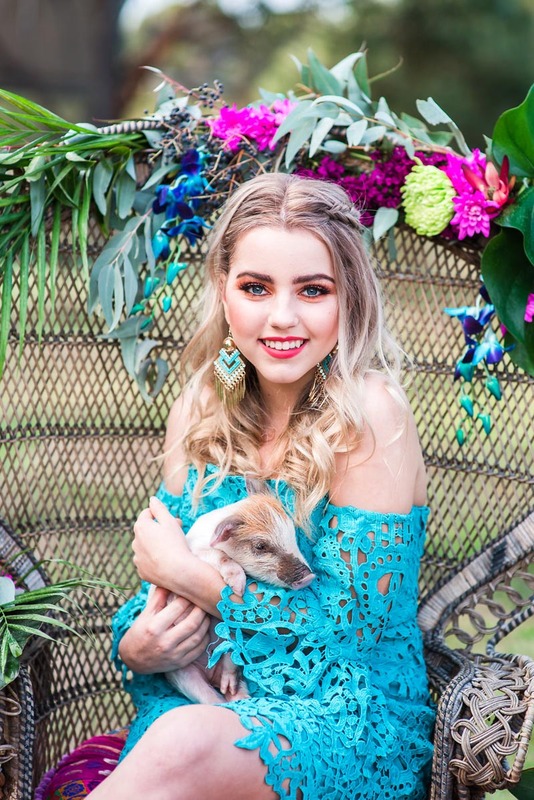 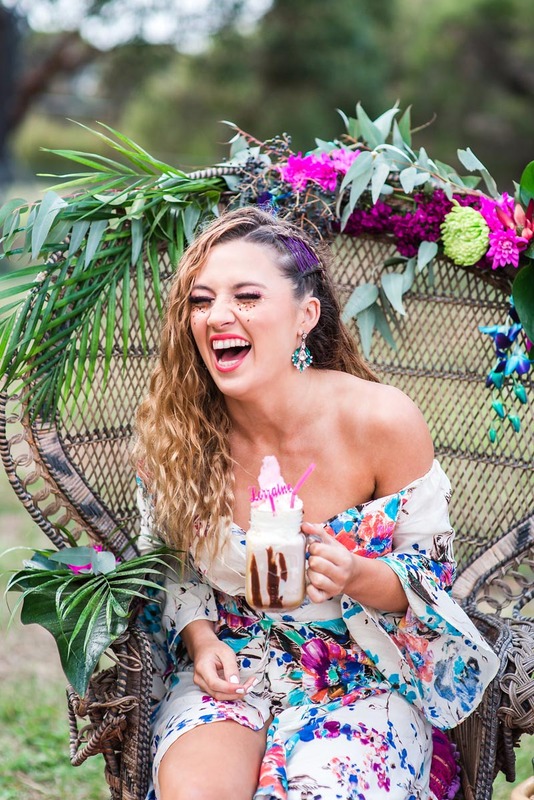 Chanae Hiller from Ahead of Style Hair Artistry, Bianca from Williams & Co Artistry and Ash from The Glam Artist tell us that the inspiration for this shoot came from the carnivale style parties in Rio, the bright eclectic fiestas in Mexico and the tropical vibe of Havana. 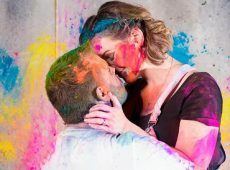 She says it was hard to put a name on the theme they were trying to create—they wanted it to be colourful and invoke feelings of fun and excitement. 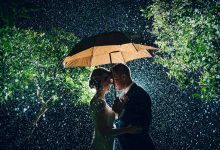 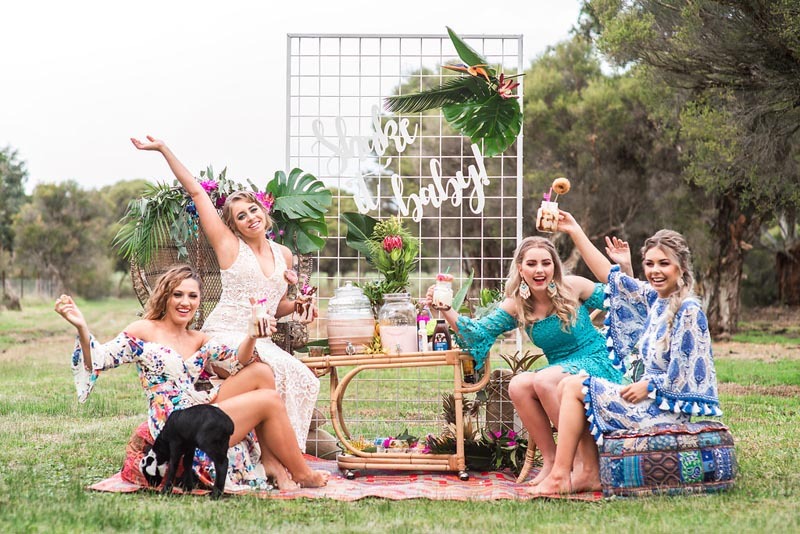 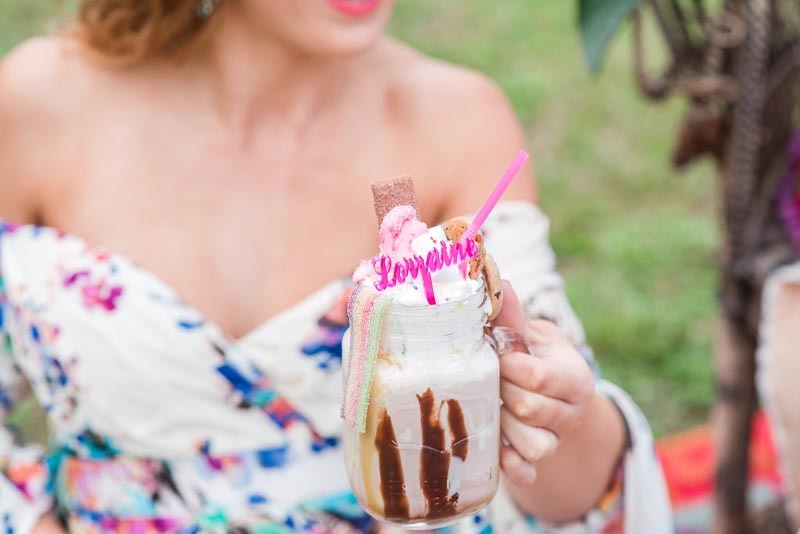 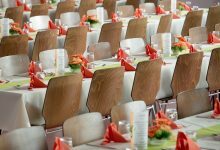 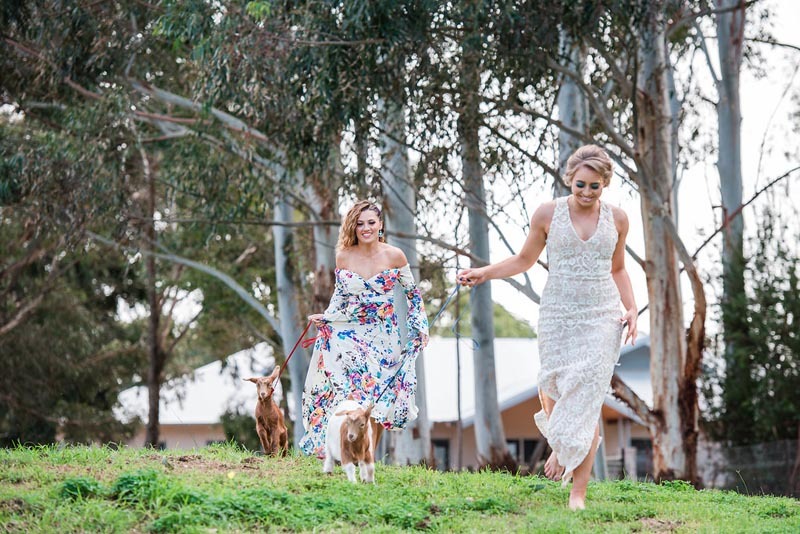 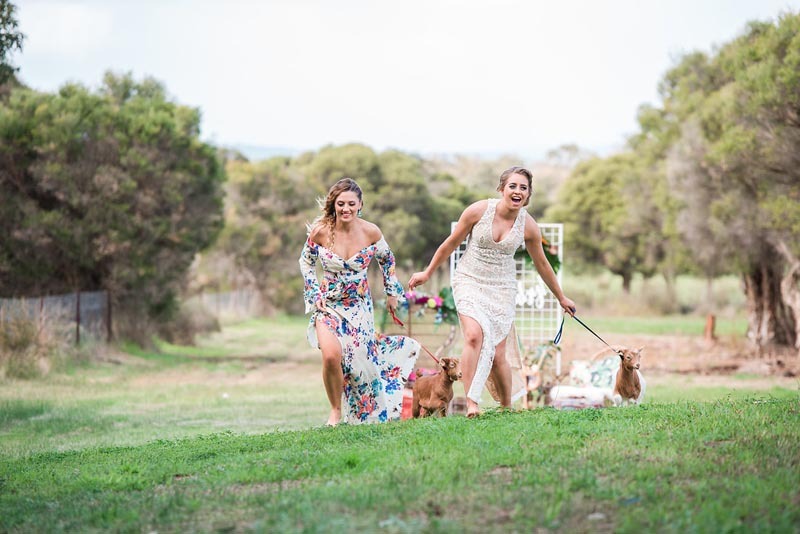 Choosing to set it as a Bachelorette/Hens Day instead of a ceremony or reception gave them more scope to fit the theme. 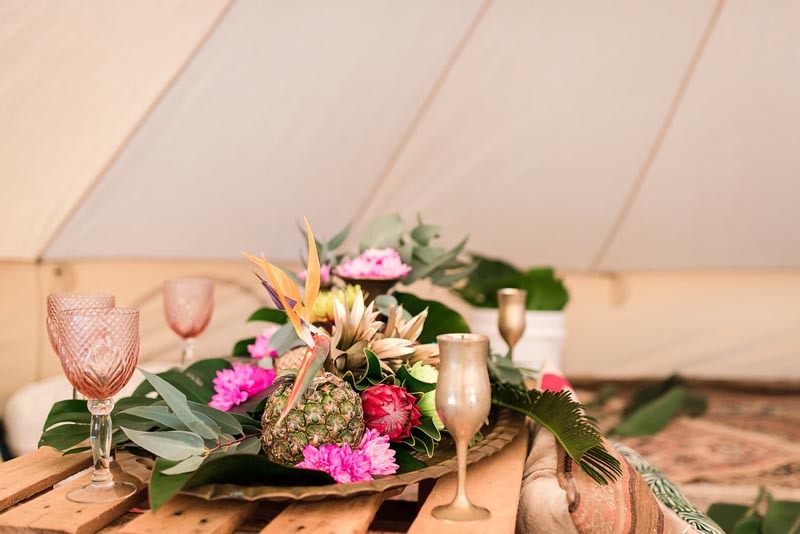 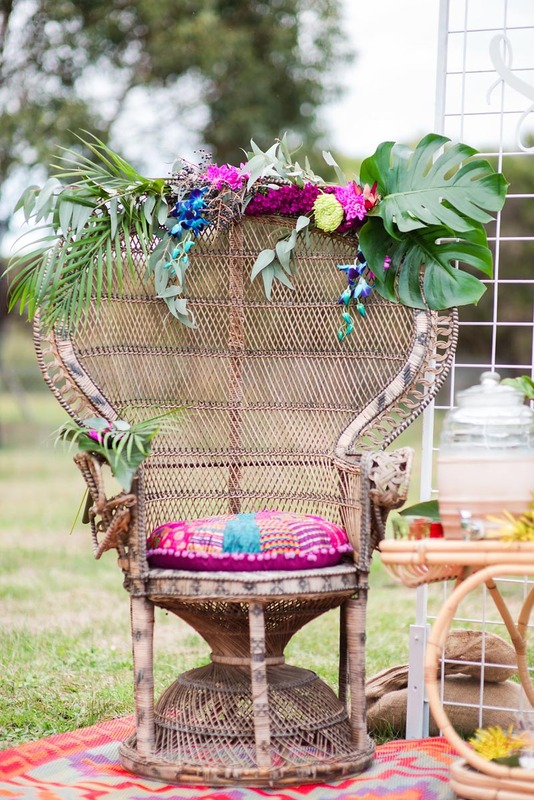 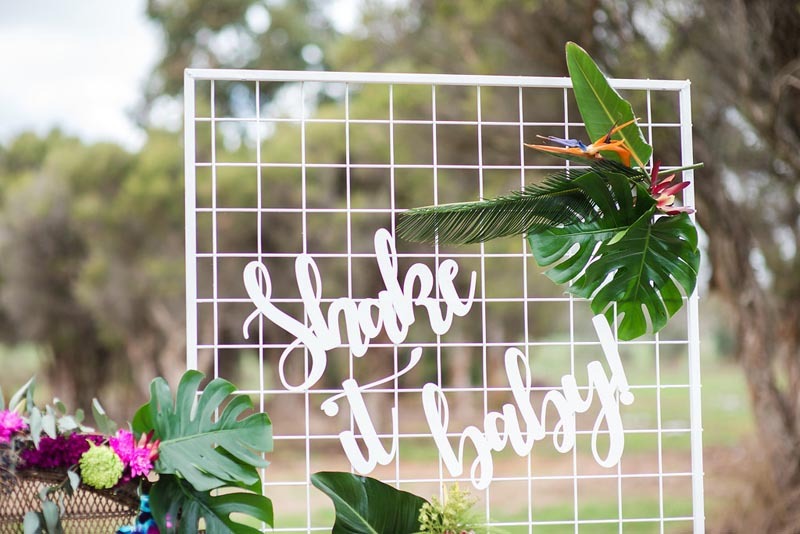 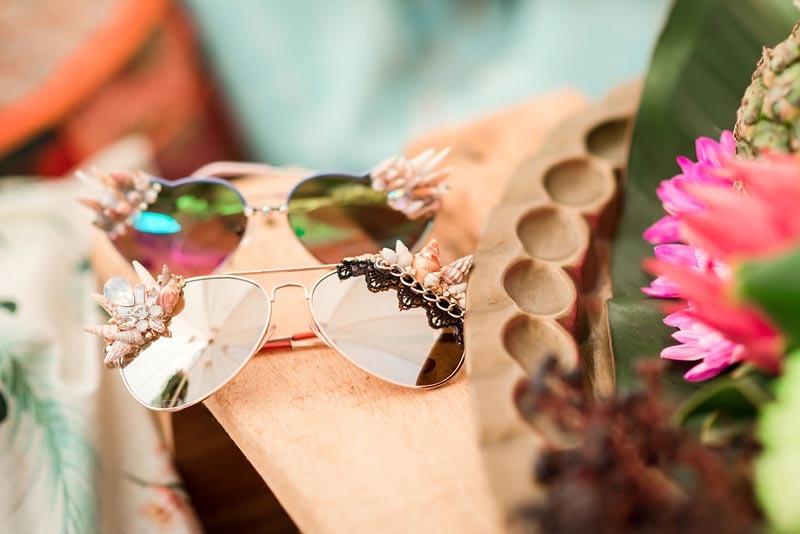 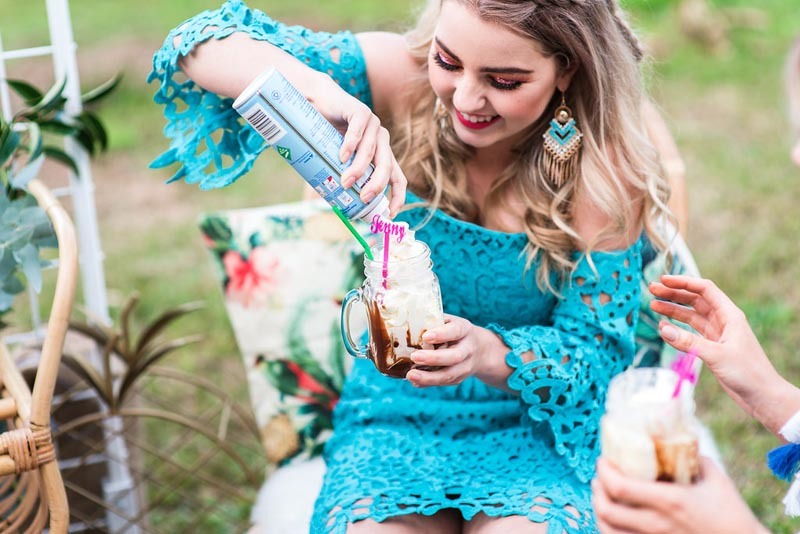 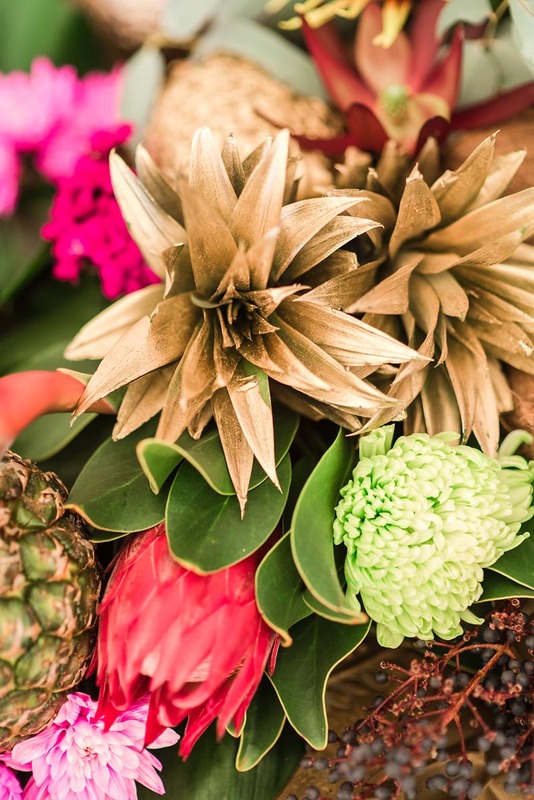 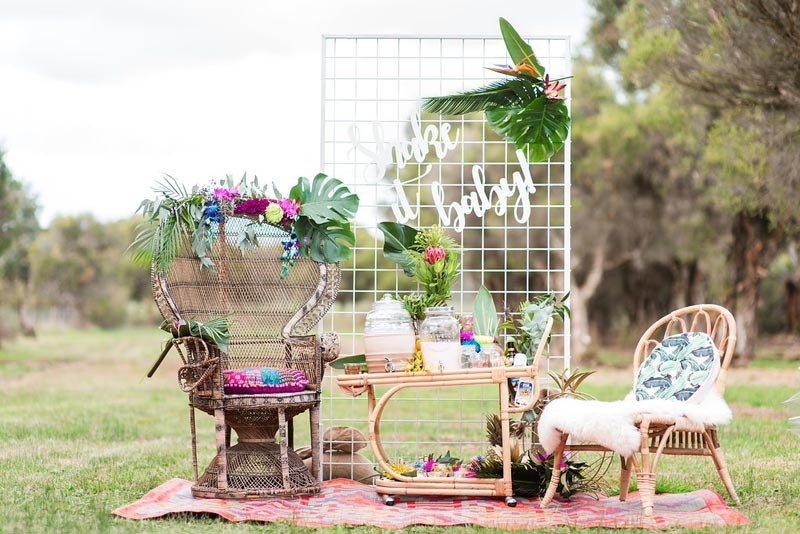 Inspired by this tropical festival vibe, the ladies behind this collaboration united to create all kinds of tropical backyard chic, stepping it up with a wild and modern take on bohemian style. 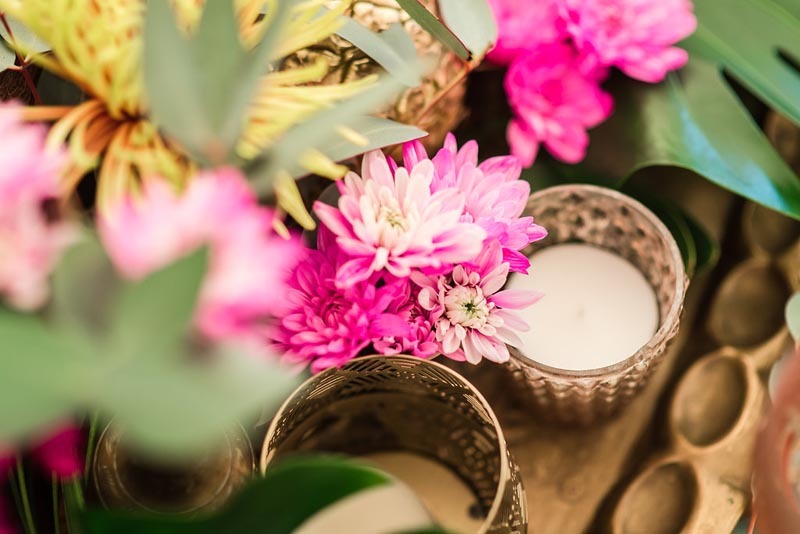 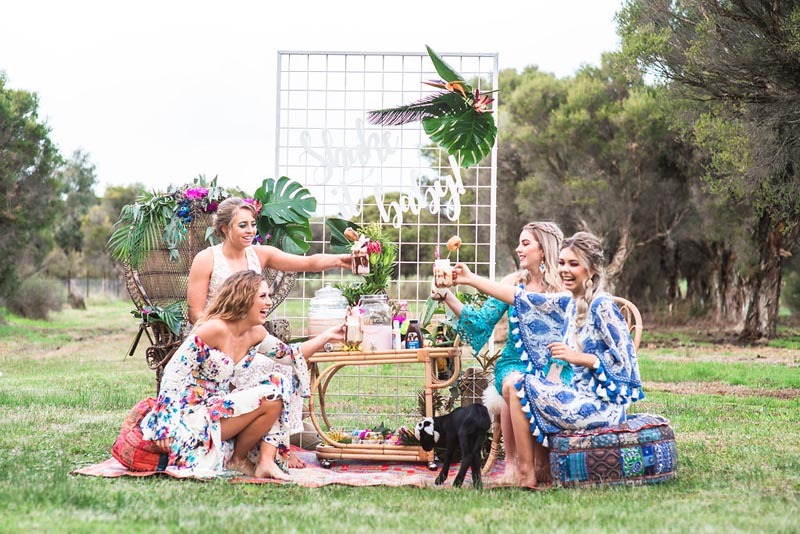 Suze from Barefoot + Boho says they didn’t hold back on setting the scene clashing colours, textures and patterns—vibrant colours, poppin’ botanicals, floral patterns, it’s feminine.. it’s fresh. 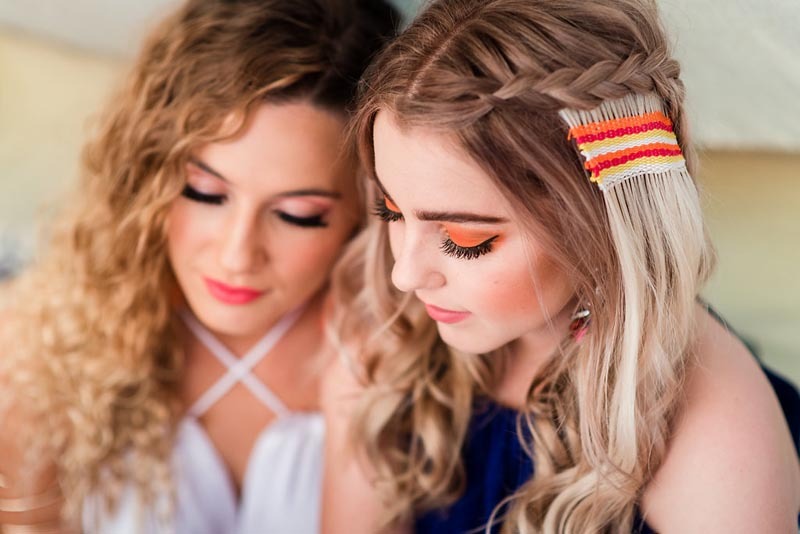 For the makeup, Ash from The Glam Artist says they wanted to be ahead of the game. 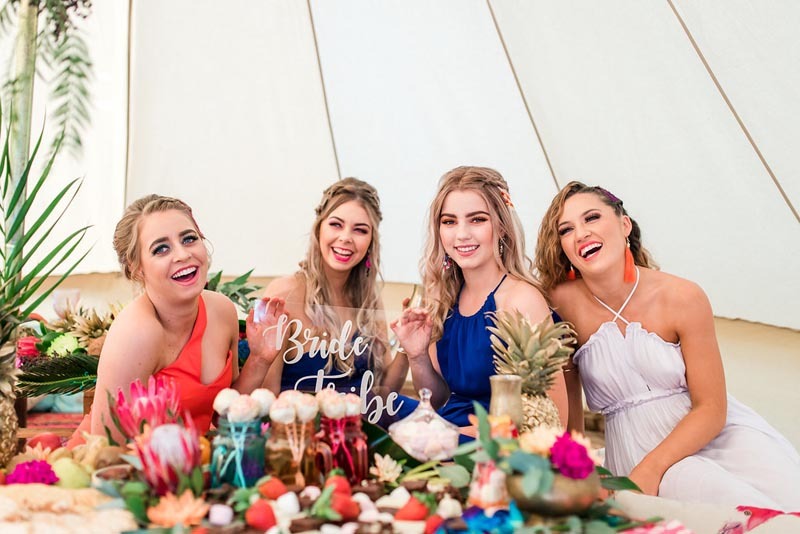 Boho is currently a huge hit with all things hens/wedding/birthdays—but she felt that the deep red lip and flower crown had done its time and it was time to see some bright, bold and fresh colours in time for the warmer months! 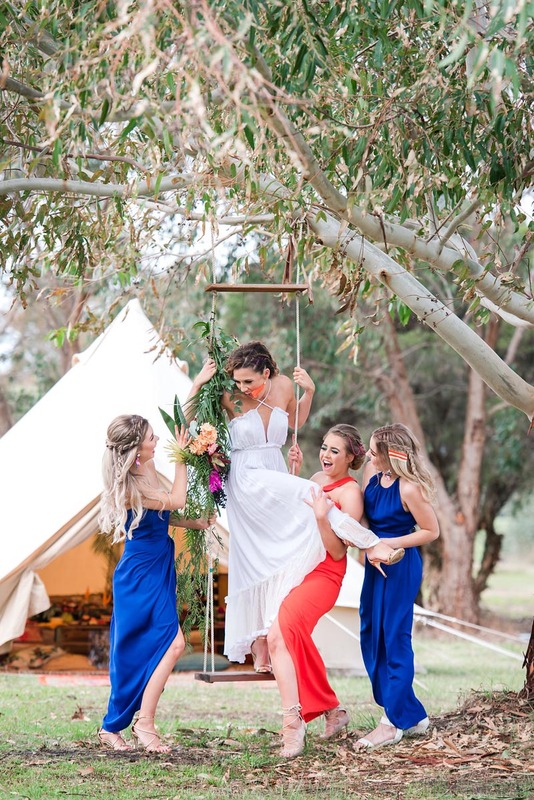 She says it was such a hoot to pull everything together! 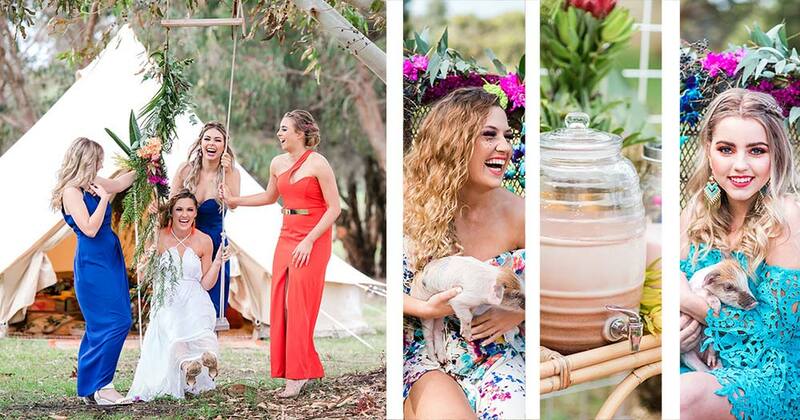 The whole shoot was brought to life by the super rad models. 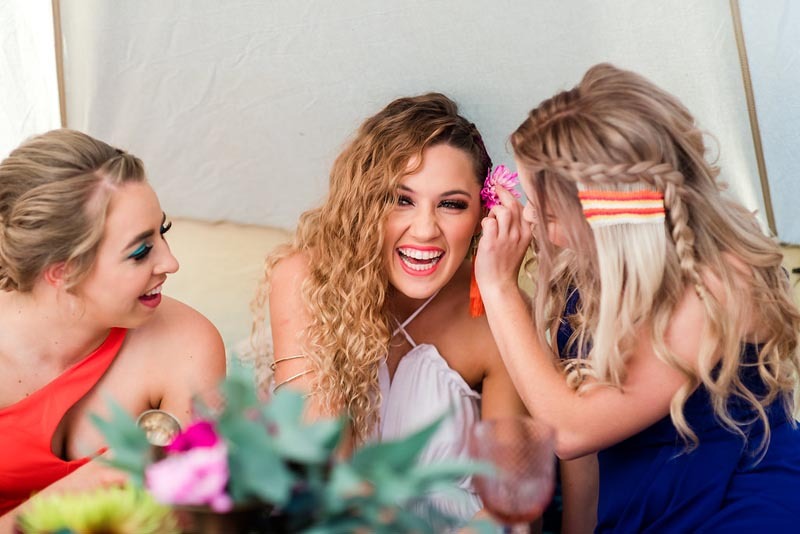 The laughter and smiles are real. 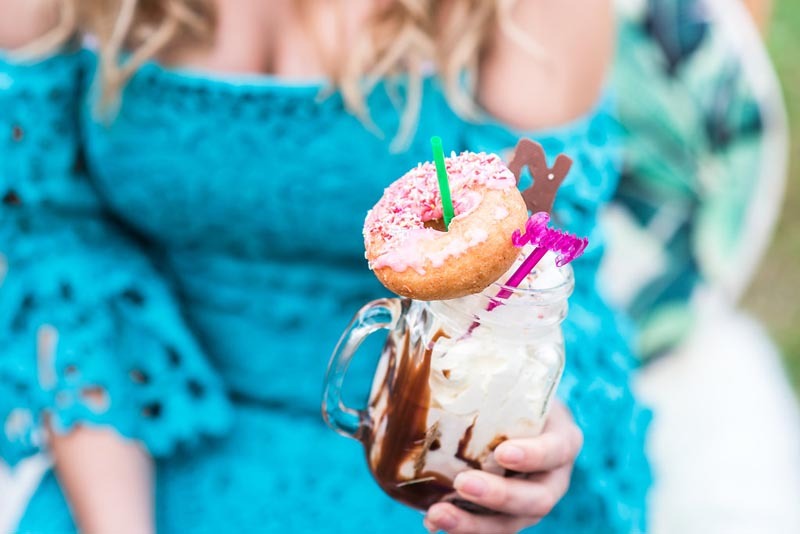 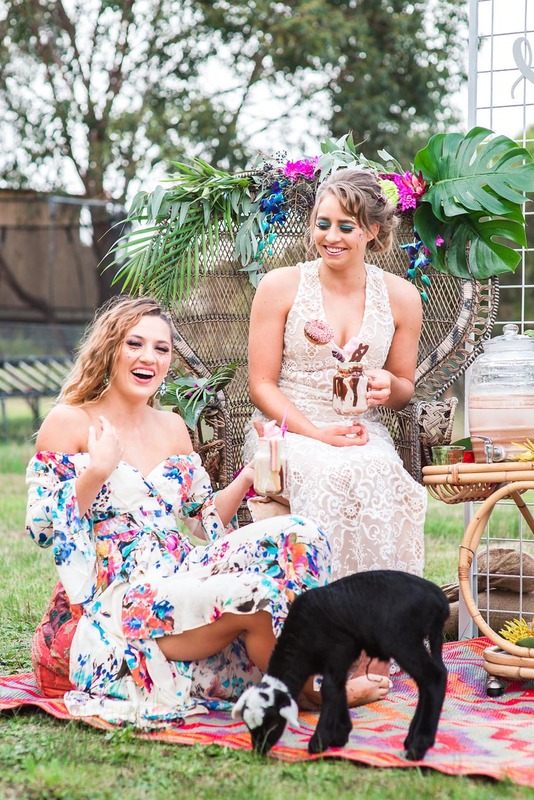 Combined that with teepees and pineapples, luscious grazers and freak shakes… and instead of flamingos .. totally adorable farm animals! 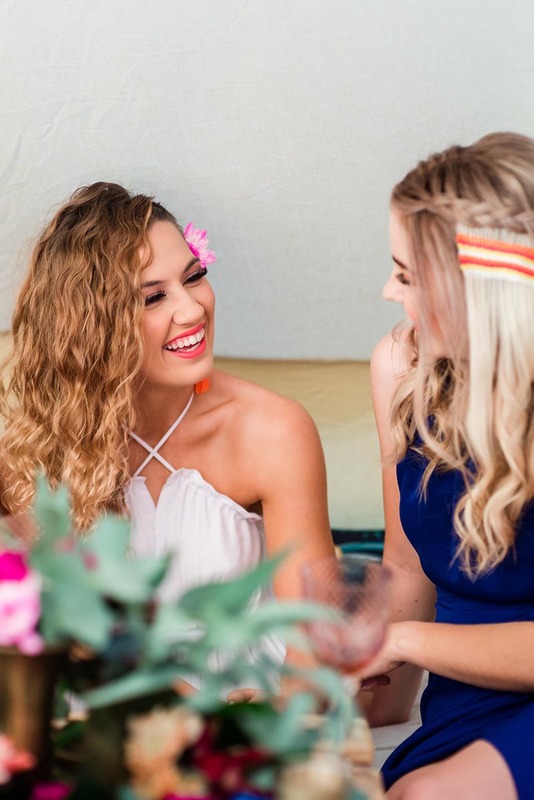 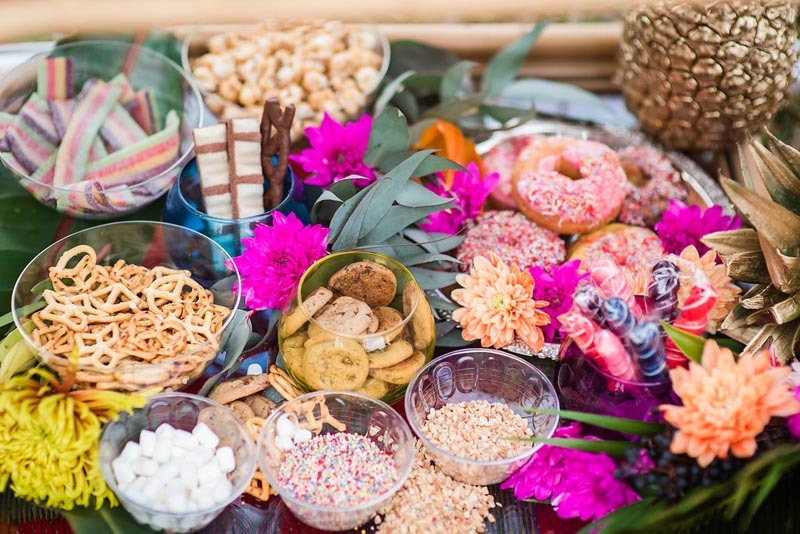 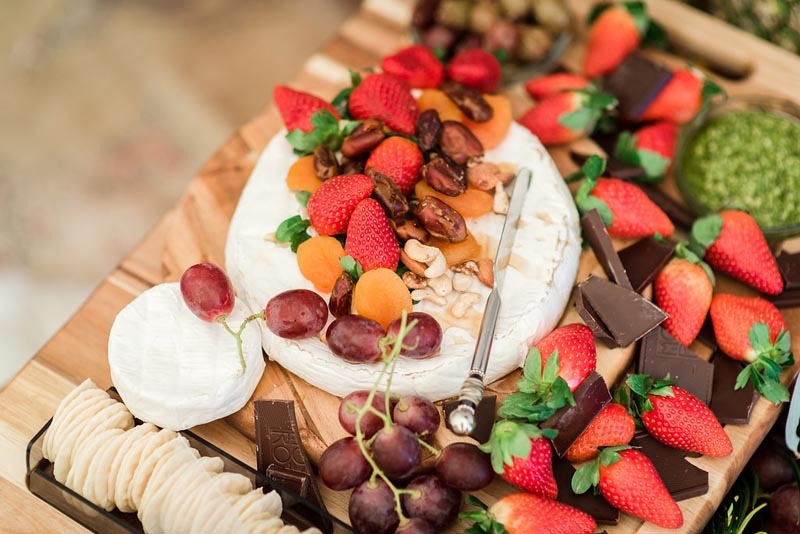 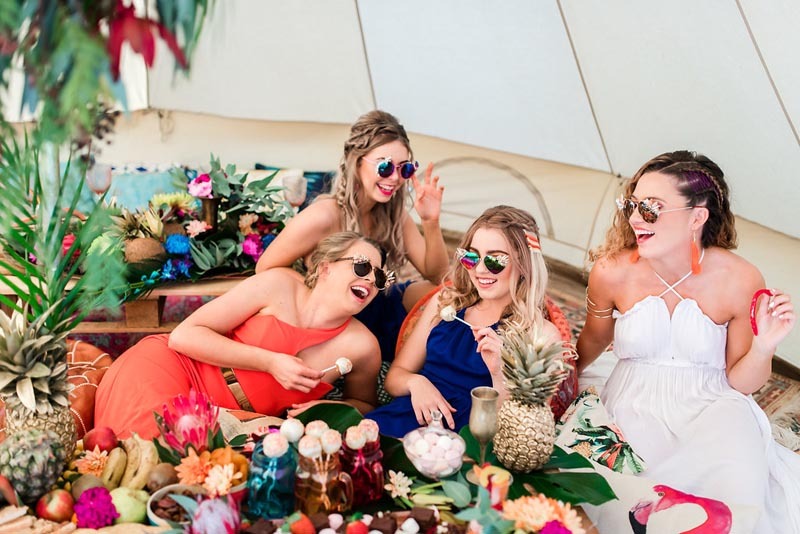 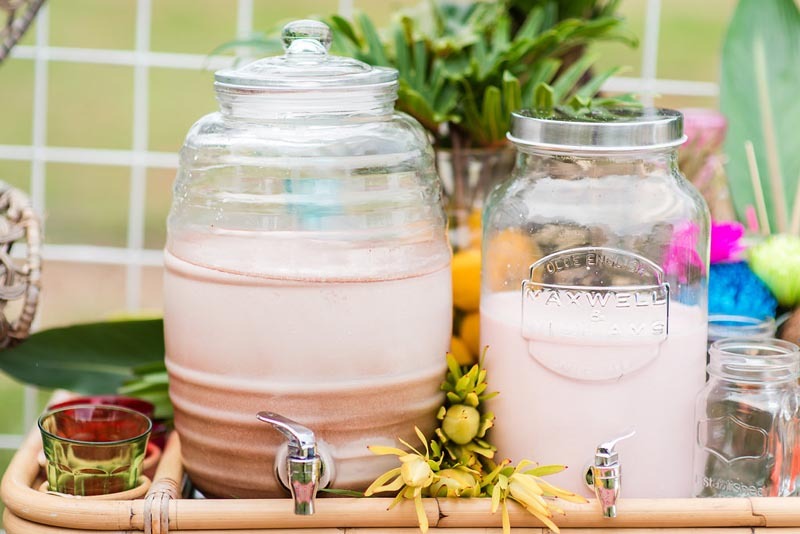 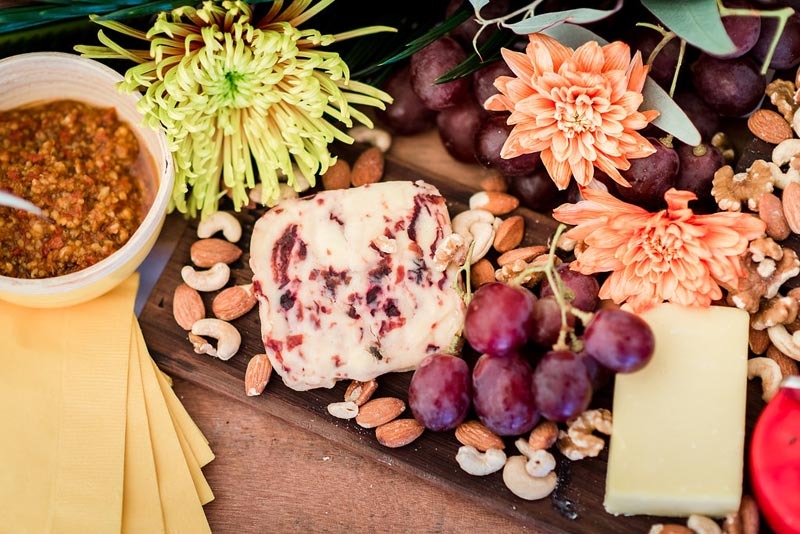 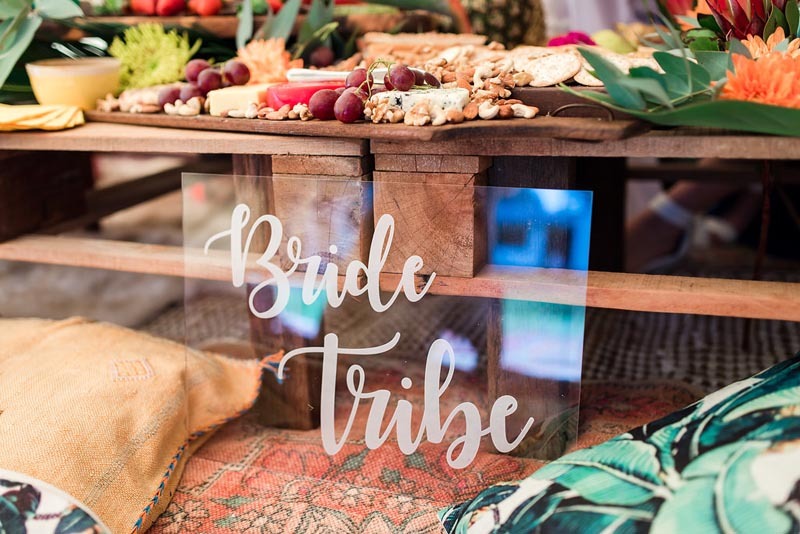 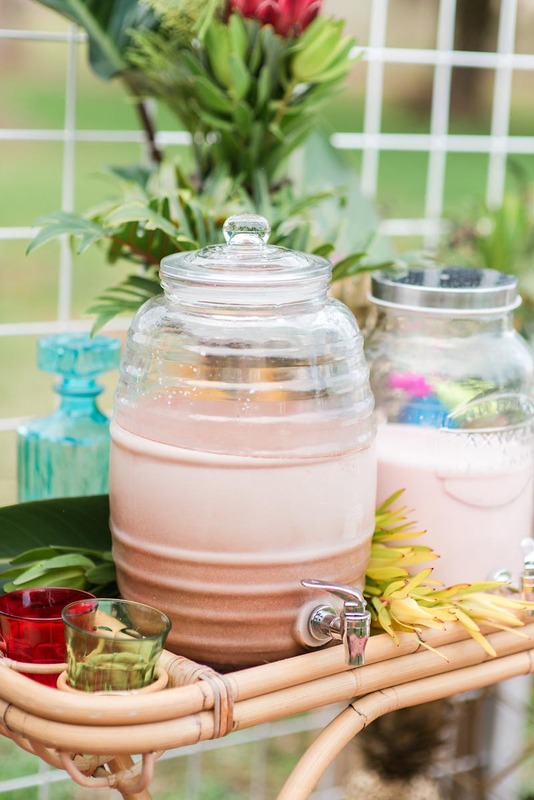 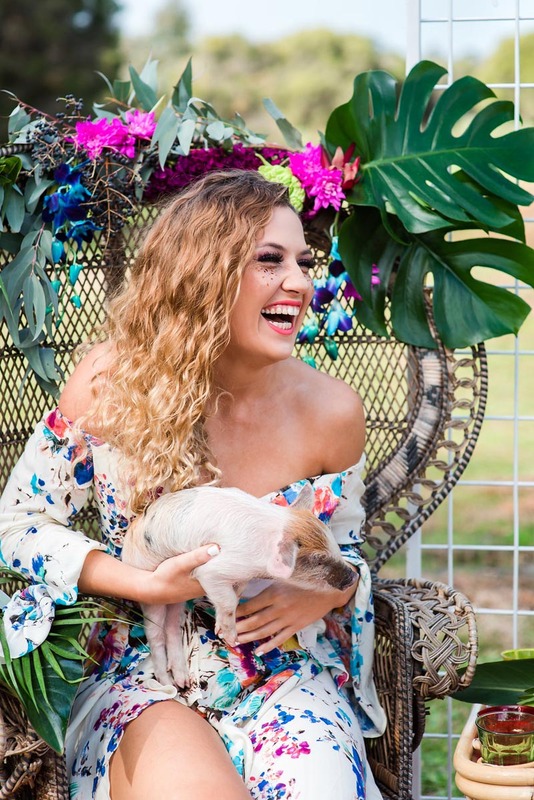 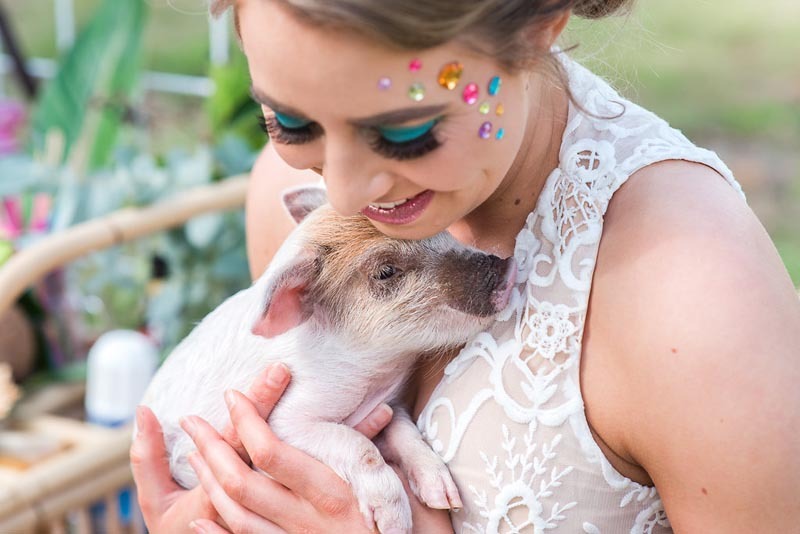 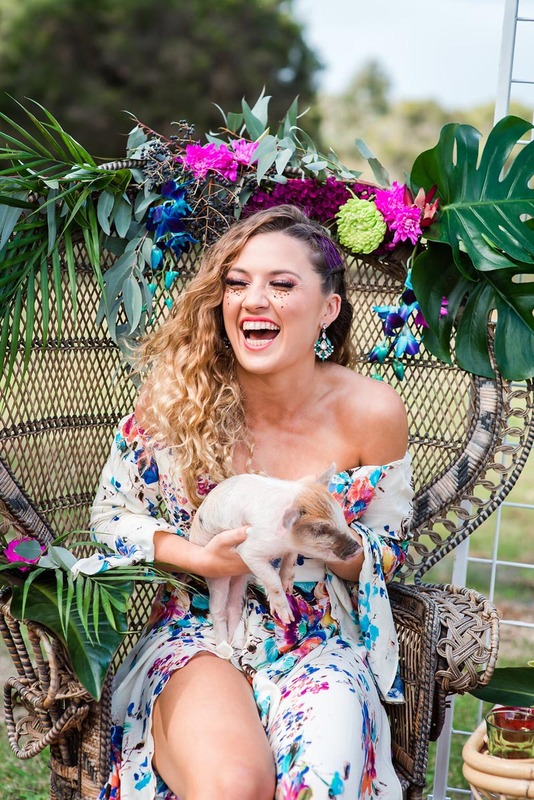 These vendors want their boho brides to be inspired to throw the ultimate bridal shower this season. 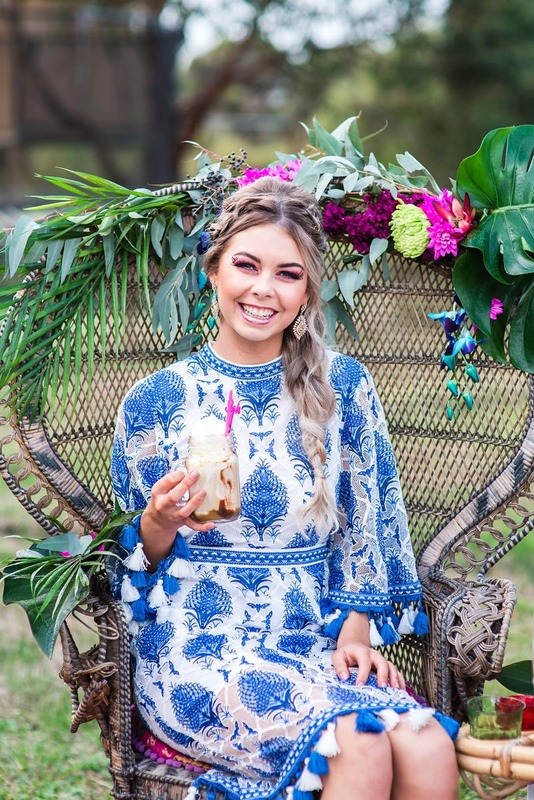 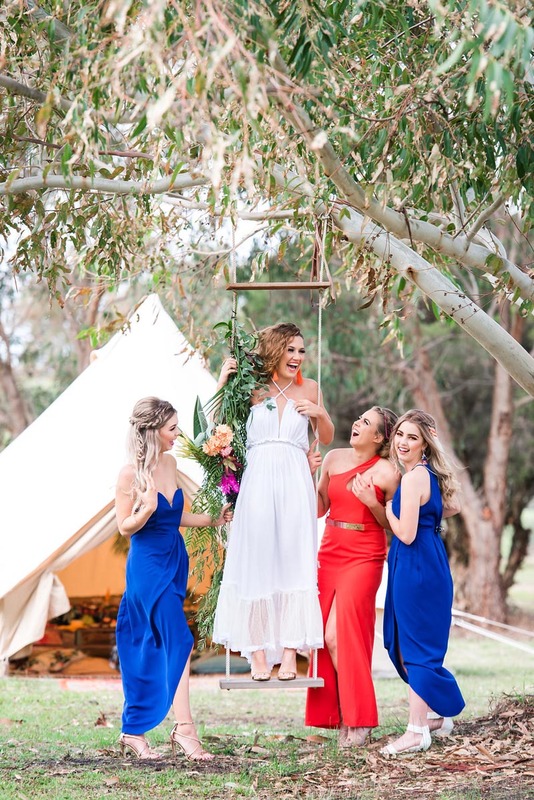 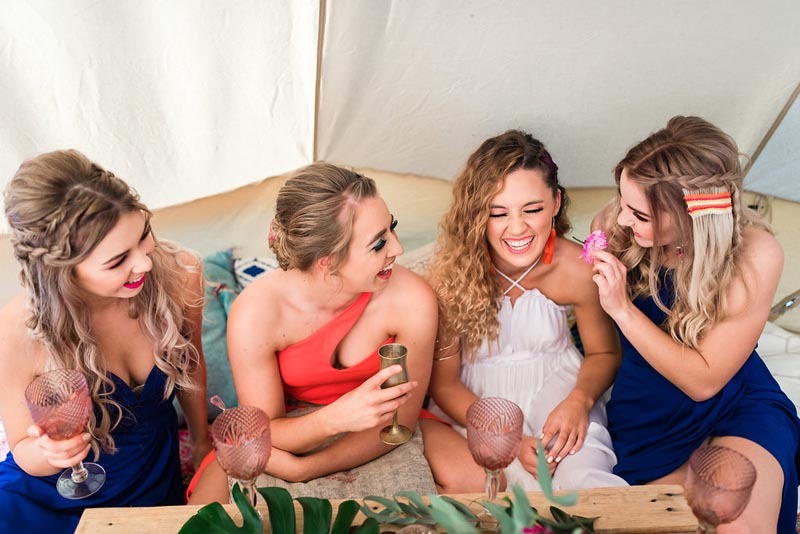 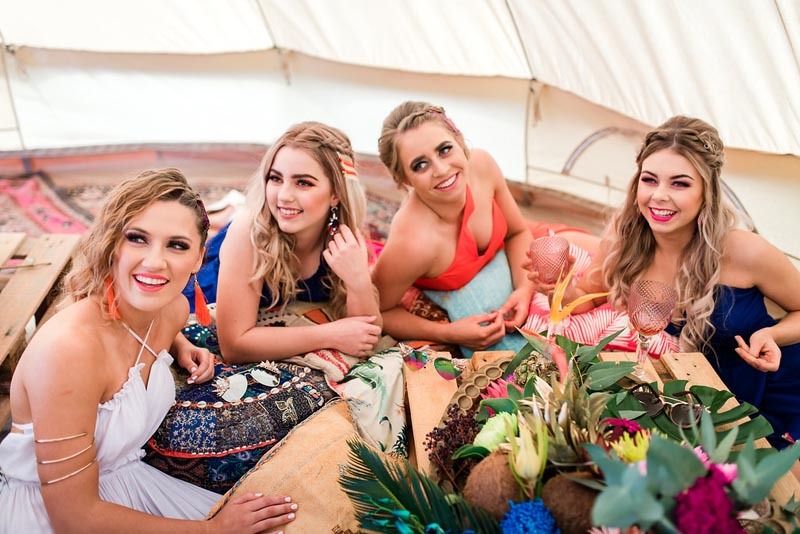 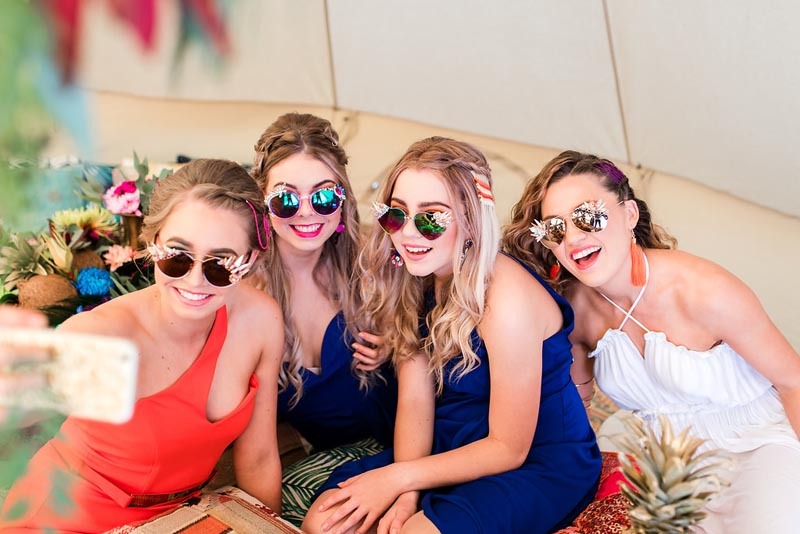 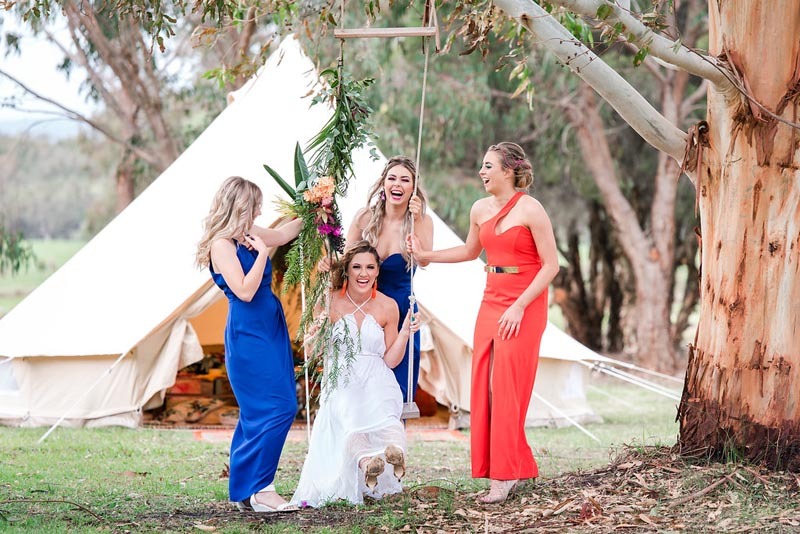 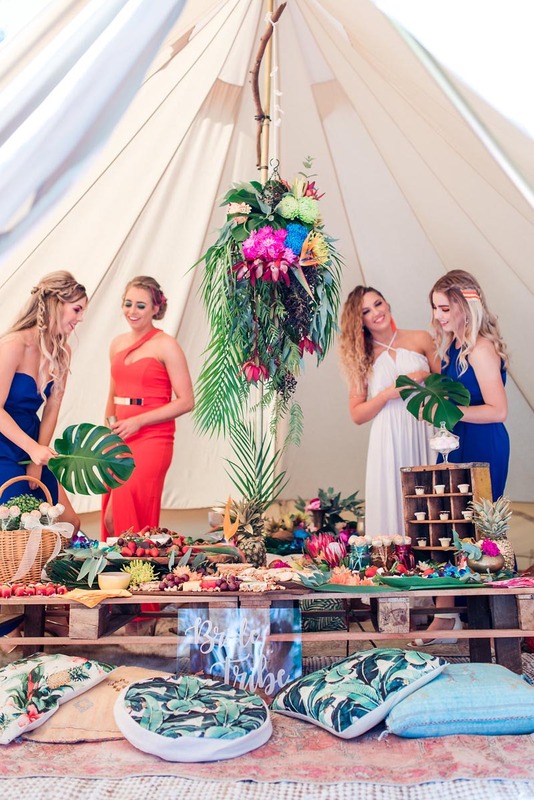 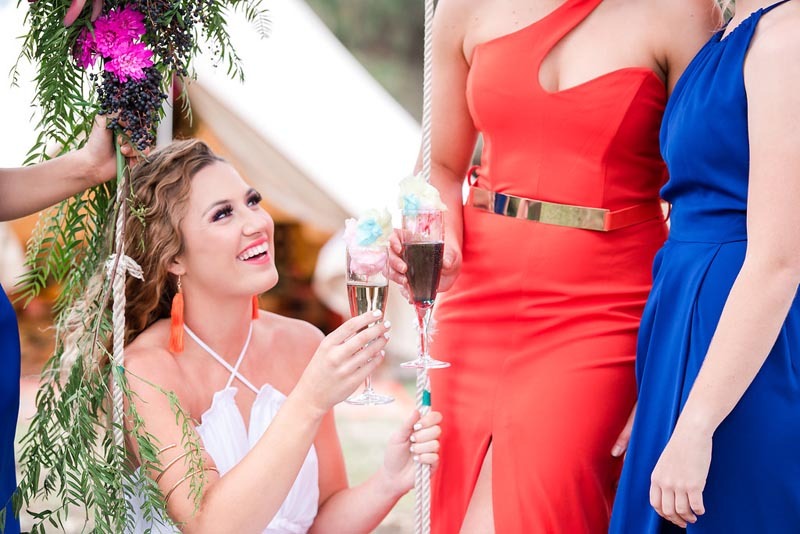 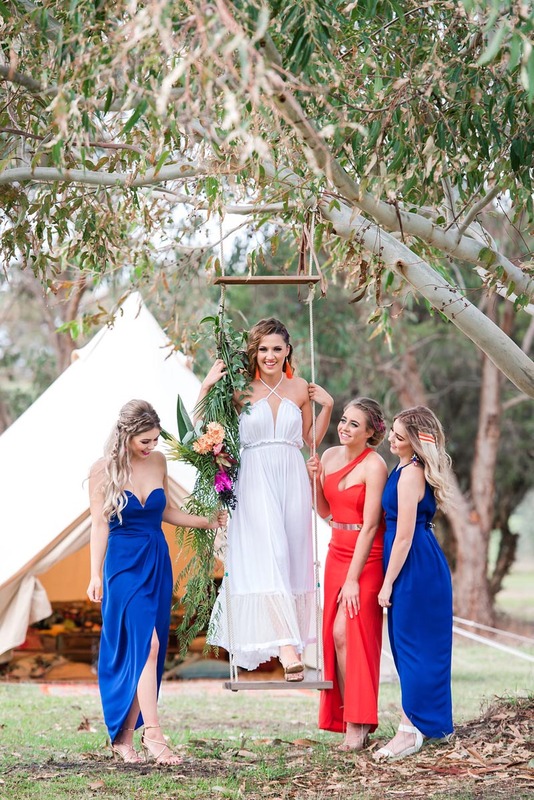 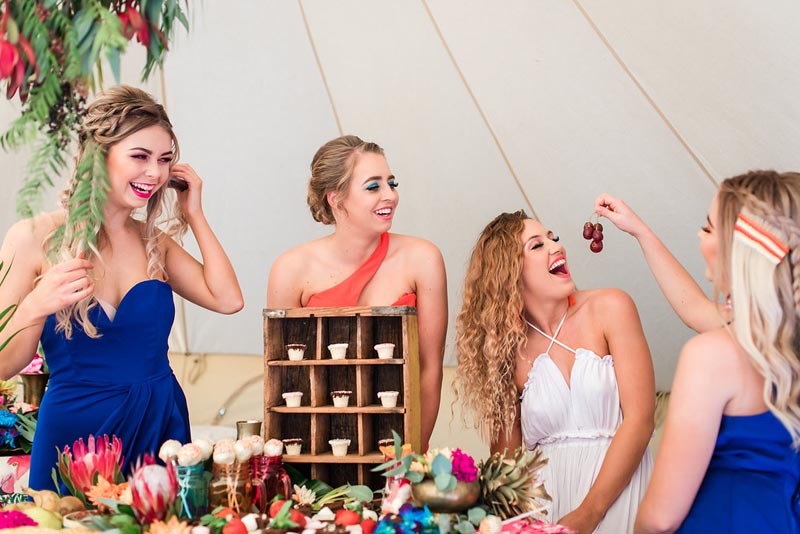 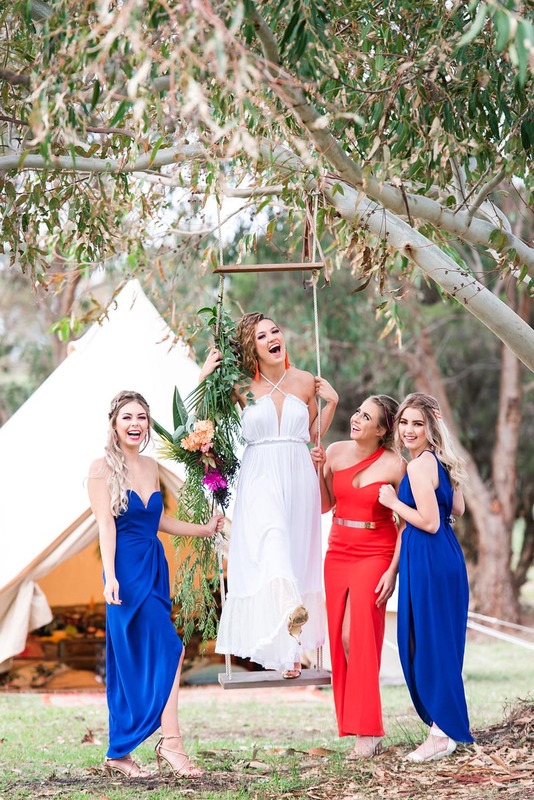 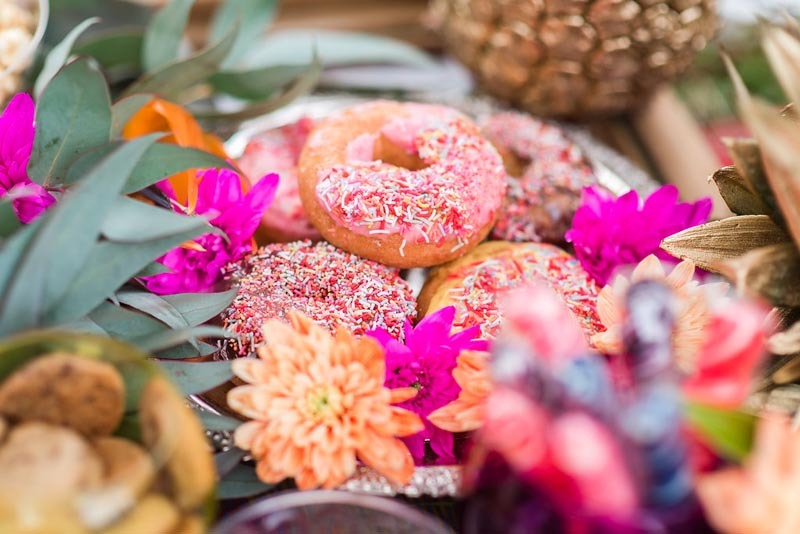 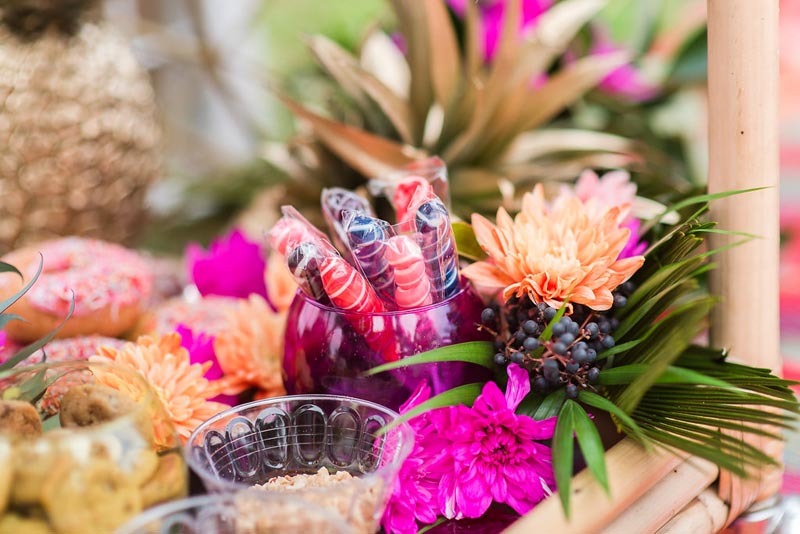 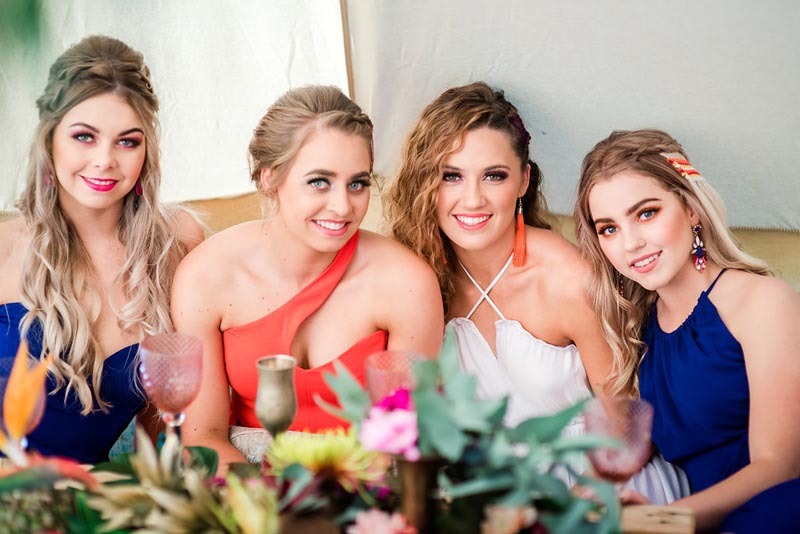 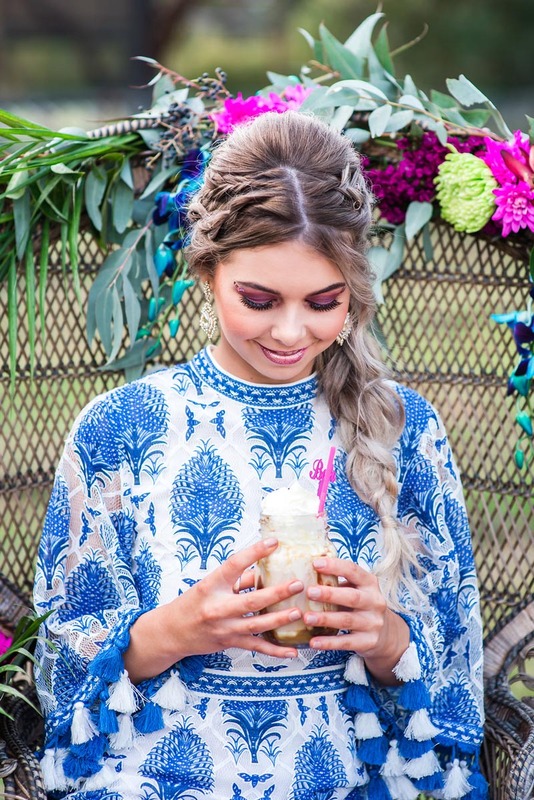 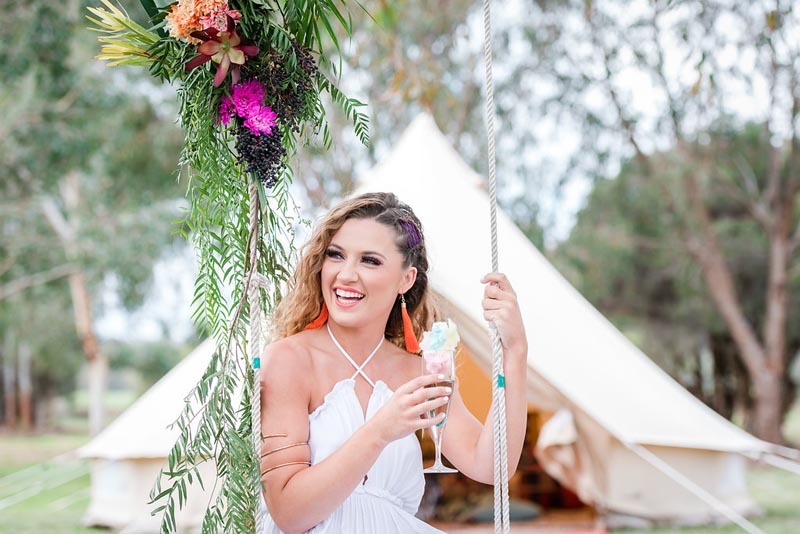 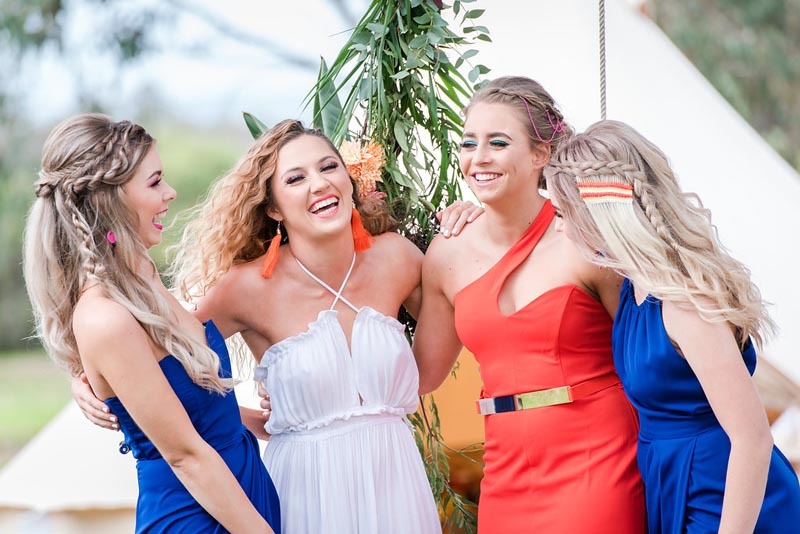 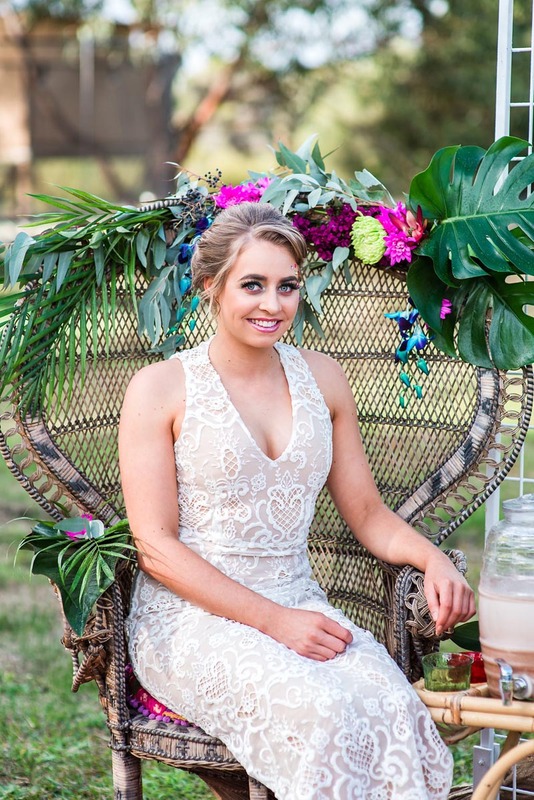 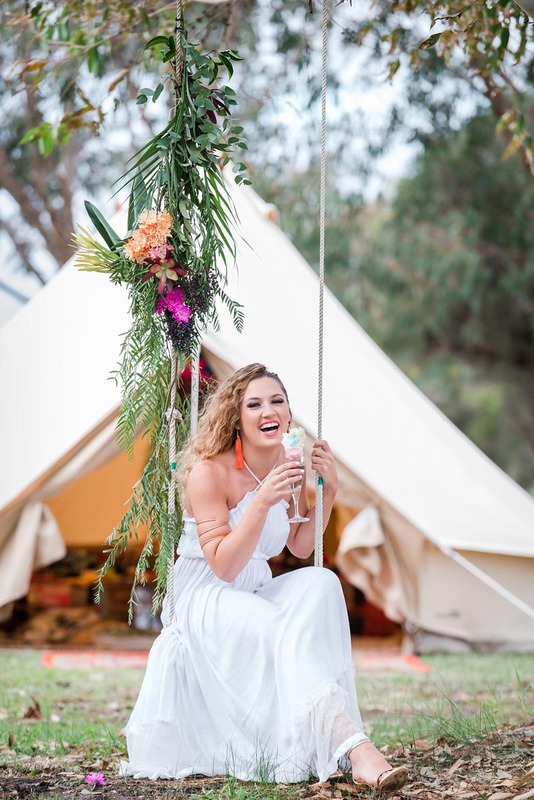 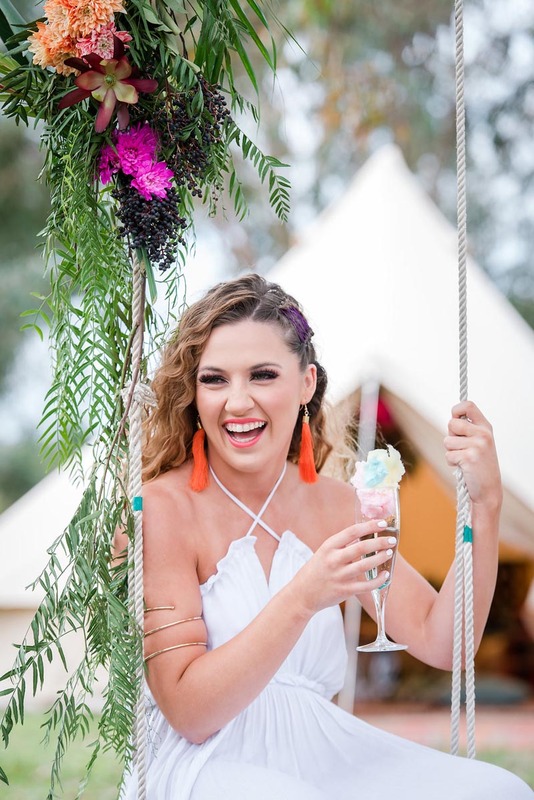 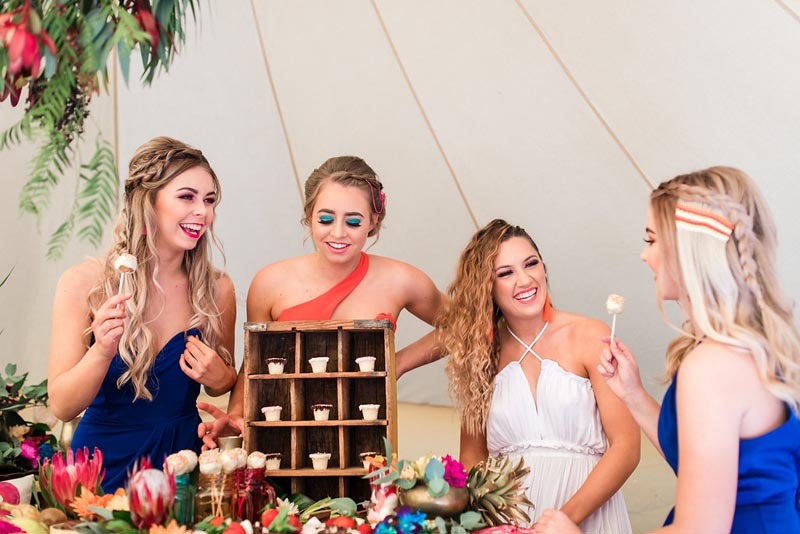 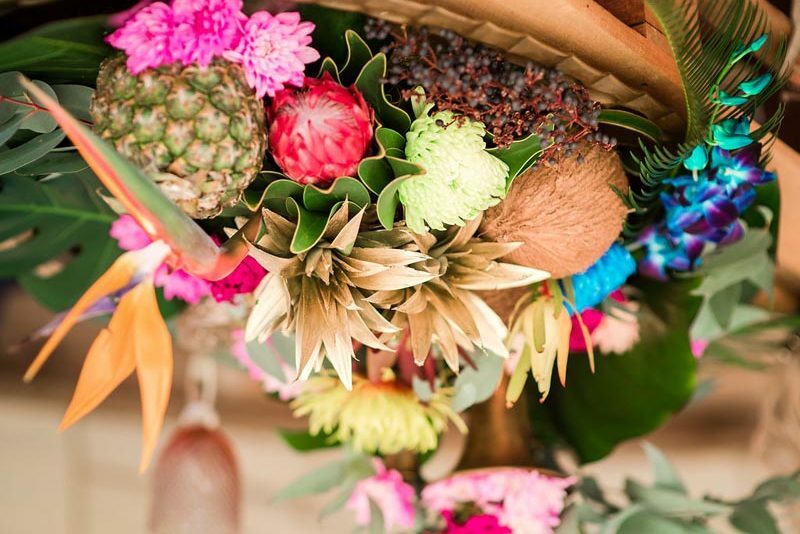 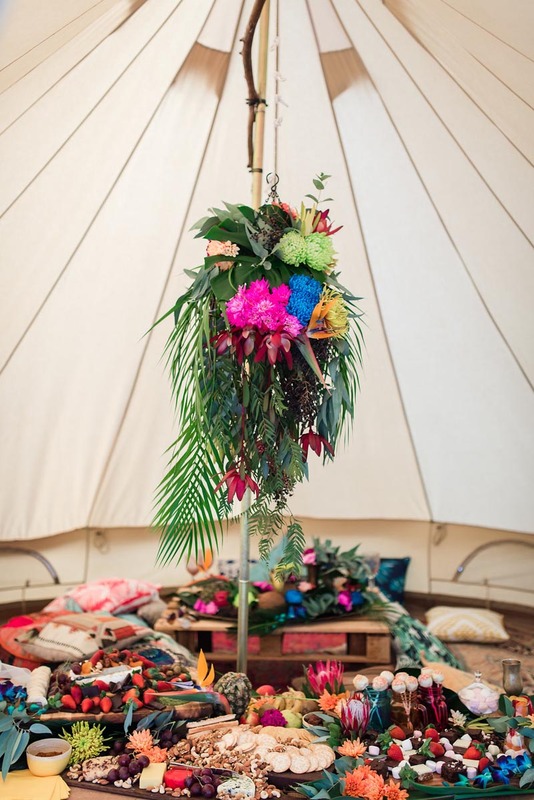 For the dresses, Jo from Infinite Outfits Dress Hire chose bright jewel tones and fun feminine textures and embellishments to compliment the Tropicana vibe. 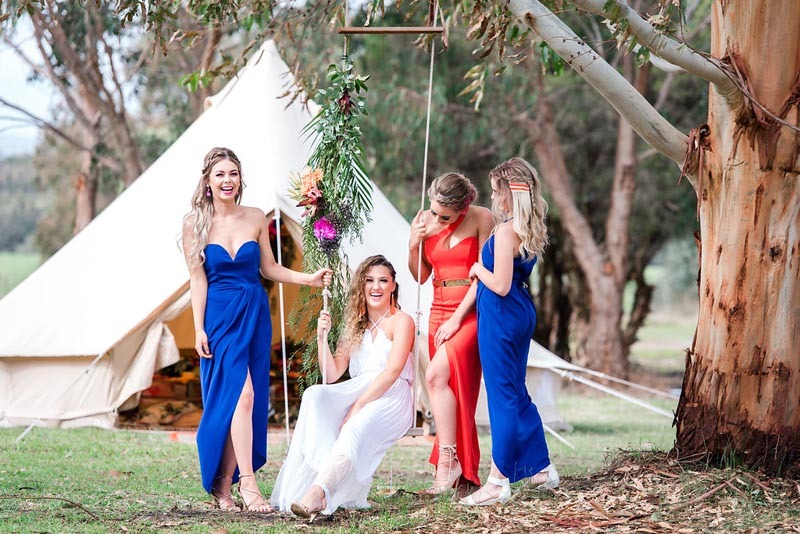 She caters to women of all shapes and sizes for any event and has a great eye for flattering styles for each individual. 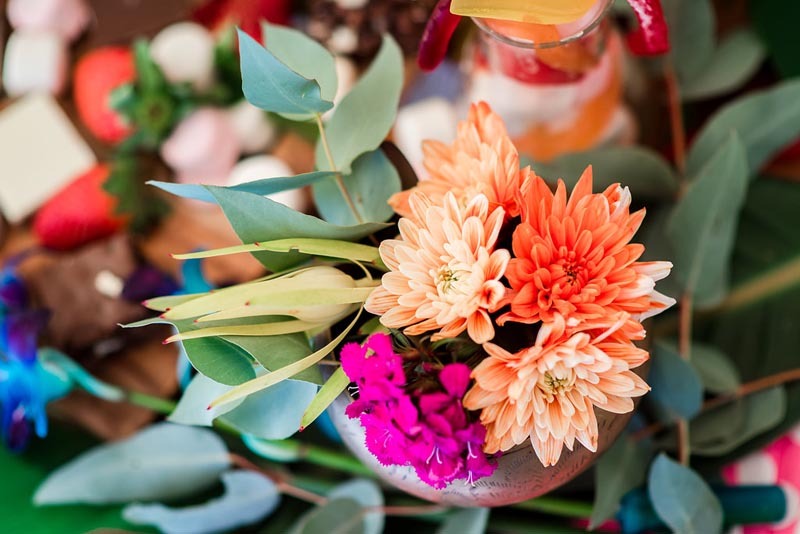 Thank you for sharing the passion & talent of these beautiful vendors that continue to work so hard. 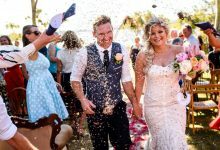 Great work from all involved and great to share!